Back in 1997, James Mangold’s understated crime thriller Cop Land gained a great deal of critical notice due to the performance of its leading man. Nothing unusual there, except that the leading man in question was Sylvester Stallone, an actor who had spent most of the previous two decades making a name for himself in films that were largely perceived as big, dumb action blockbusters. Since Cop Land has subsequently gone down in history as the film that ‘rehabilitated’ Stallone as an actor, the comparisons it invites to Henry Hobson’s Maggie, which appears to do the same for Stallone’s Expendables co-star Arnold Schwarzenegger, are inevitable. Maggie is superficially a zombie film, but to categorise it as such is something of a disservice. Much of the pop-culture folklore remains intact, but writer John Scott III’s stroke of genius is to have the ‘turn’ of the infected from human to zombie take six to eight weeks, rather than the usual handful of hours. 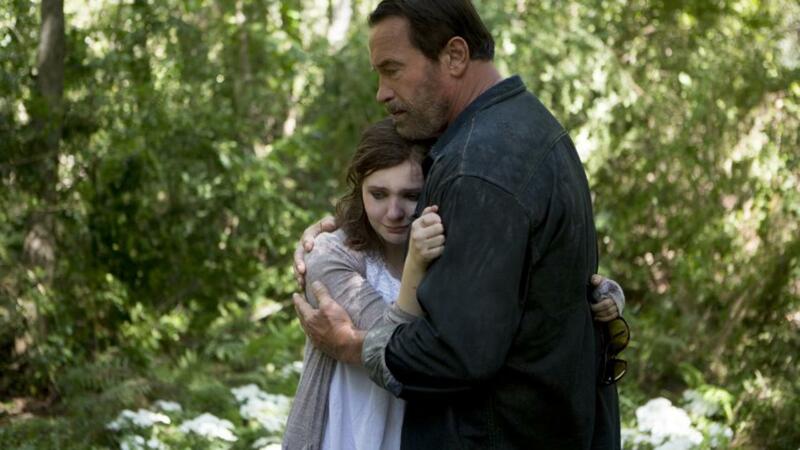 When farmer Wade Vogel (Schwarzenegger) tracks down his daughter Maggie (Abigail Breslin) in a city ravaged by a zombie outbreak (here brilliantly dubbed the “necroambulist” virus) she’s already been bitten, but he knows it’ll be more than a month before she loses her humanity. With the help of an old doctor friend, he takes her home to spend her last few weeks surrounded by friends and family, under the ever-watchful eye of Maggie’s pious and conflicted stepmother Caroline (Joely Richardson). As the weeks go by, Wade seems more and more reluctant to say goodbye and take his daughter to the dreaded quarantine camps, even as Maggie becomes a little less human (and a lot more dangerous) with each passing day. So is Maggie Schwarzenegger’s Cop Land? Yes, for the most part. When given more than a couple of lines of dialogue, Arnie unfortunately reverts to type, but in scenes where he says few or no words at all he’s utterly mesmerising. Radiating an agonising mixture of rage, doubt and grief, he struggles through the film with a titanic weariness that completely sells Wade as a man who knows his daughter is turning into a monster, and has no idea what to do about it. 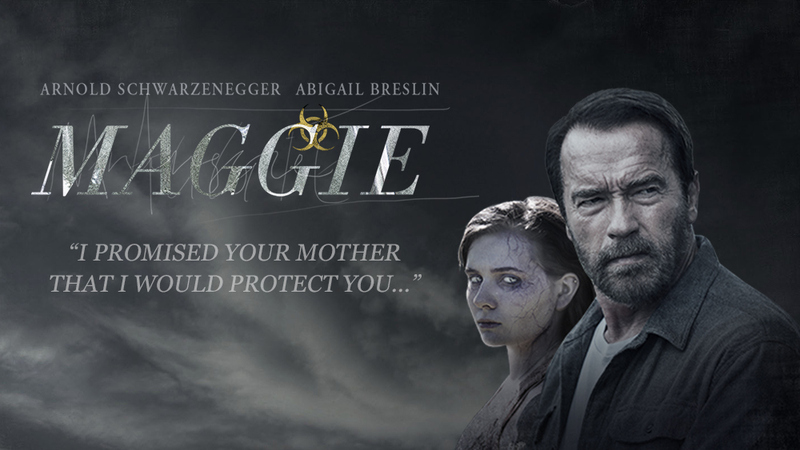 Schwarzenegger’s performance will dominate the film’s reviews, but to focus purely on his achievements here does a massive disservice to Abigail Breslin and Joely Richardson, both of whom are equally superb. Breslin in particular is the emotional core of the film; the story begins and ends with Maggie, and it’s both gripping and heartbreaking to watch her desperately try to reassert control over her own fate, even as life slips away from her. Richardson gives a nicely nuanced performance as a character who could easily have become a simple hate figure, but instead ends up representing the dreadful but necessary rationalism that Wade seems unable or unwilling to accept. Maggie is as much about terminal illness as it is about fictional monsters. Hobson’s inter-cutting of ranging long shots and intimate close-ups hints at a desolate world on the brink of catastrophe, but keeps the focus on one grieving family, wringing every drop of fear, pain and sorrow from the situation. If that makes Maggie sound like a particularly harrowing film, that’s because it is, but it’s also a beautiful one. Although much of the symbolism on show is pretty heavy-handed, there’s an elegant economy to the storytelling that lets emotion flow freely, supported by David Wingo’s (Take Shelter) lush but mournful score. Maggie might be billed as an innovative zombie movie, but in reality it’s a deeply affecting film about fathers and daughters. Maggie is due for UK-wide release on 24th July.